As bronzed leaves float from trees and the evenings begin to draw in, Autumn is truly upon us and the summer’s heatwave feels like a distant memory. Whilst we’ll miss days spent frolicking on the beach and garden barbecues played out to the sound of clinking ice cubes from our gin and tonics, we’re excitedly waving goodbye to the collection of fans cluttering up the office and welcoming the change of season with open arms. Hello lazy bubble baths, homemade apple and blackberry crumbles and hot chocolates enjoyed from a cosy cocoon of blankets! Once we've hung up our Halloween costumes and composted the pumpkins, and before our minds get lost in a whirlwind of Christmas markets and present shopping, we remember that the 5th November is just a few weeks away, where explosions of colour light up our skies and the resounding booms rumble in our chests. 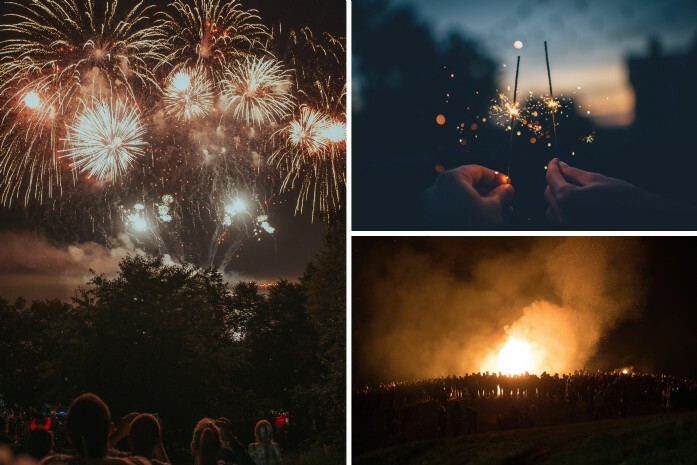 With impressive fireworks set to blaze across our landscapes, we share our favourite bonfire night displays and the properties to enjoy them from. Whilst the village of Ottery St Mary in Devon have a firework display and bonfire on the bank of the river Otter, they also have an age old tradition that makes this event so unique. Line the streets to see locals charging through the crowds with flaming wooden barrels of tar hitched to their backs, a spectacle not to be missed. The charming coastal village of Polperro comes alive on Guy Fawkes night where fireworks are let off from 'Peak Rock' allowing spectators to see the display reflect off the ocean and light up the harbour with a riot of colours. Often regarded as one of the most famous bonfire events in the UK, the celebrations in Lewes are closer to a carnival than the average village fireworks display, thanks to the lively street processions, electric atmosphere and live music. Now running for over 30 years, the Cheltenham Round Table Fireworks promises an evening of entertainment including fairground attractions, refreshments and fireworks (of course!). This is a ticketed event, however all proceeds go to local charities. With a themed event and displays timed to music, the firework spectacular at Leeds Castle promises an audio-visual treat like no other.